Difficulty Notes: Despite some scrambling moves to the immense summit cairn, the biggest challenge on this ridge is getting to it – it’s very remote. 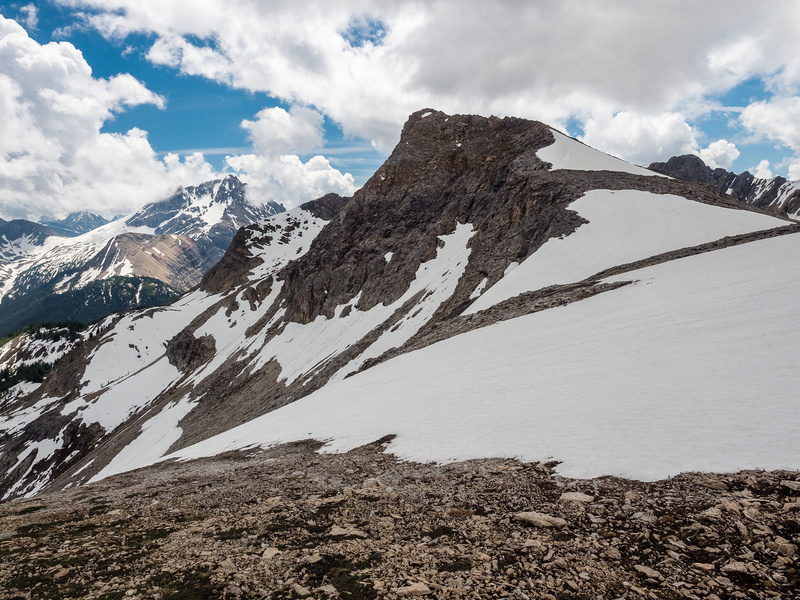 As we traversed to the summit of Mount Currie, my eyes were immediately drawn to a distinctive ridge running west of Currie, lower down and guarding Cross Lake (which wasn’t visible from our vantage). 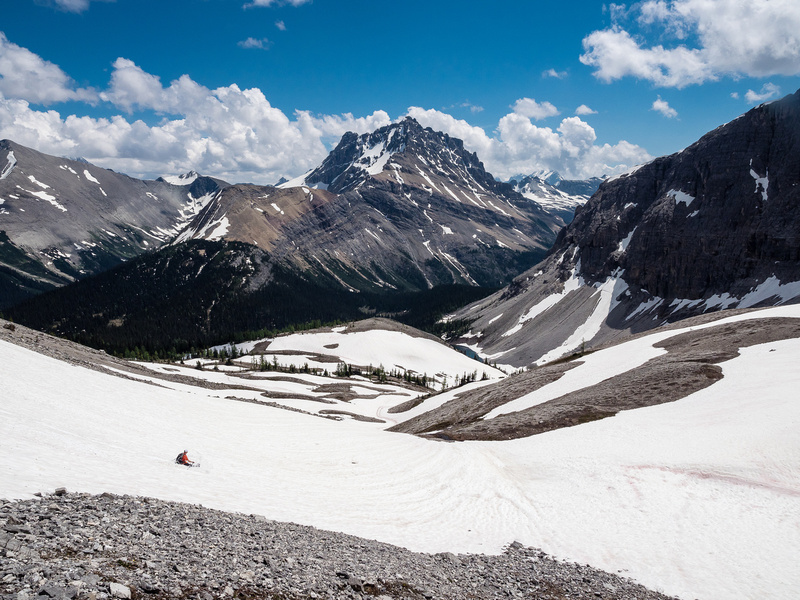 This ridge was obviously connected to Mount Currie and it looked to be very reasonable to traverse it before descending past Cross Lake to the historic White Man Pass before following the trail back down to our original ascent line and of course to the bikes at Bryant Creek. Given the historic nature of the pass and the surrounding area, I was immediately excited to add this not-inconsiderable distance and height gain to our (already long) day trip. Phil, in characteristic enthusiasm for side, exploratory excursions, replied, “why wouldn’t we do that?”, and so it was decided. Of course we still had to tag the actual summit of Mount Currie at this point! The history of the White Man Pass fascinates me for several reasons. Firstly, I’ll admit that the idea of the settlers navigating through untouched wilderness in the mid-1800’s is naively romantic for me. 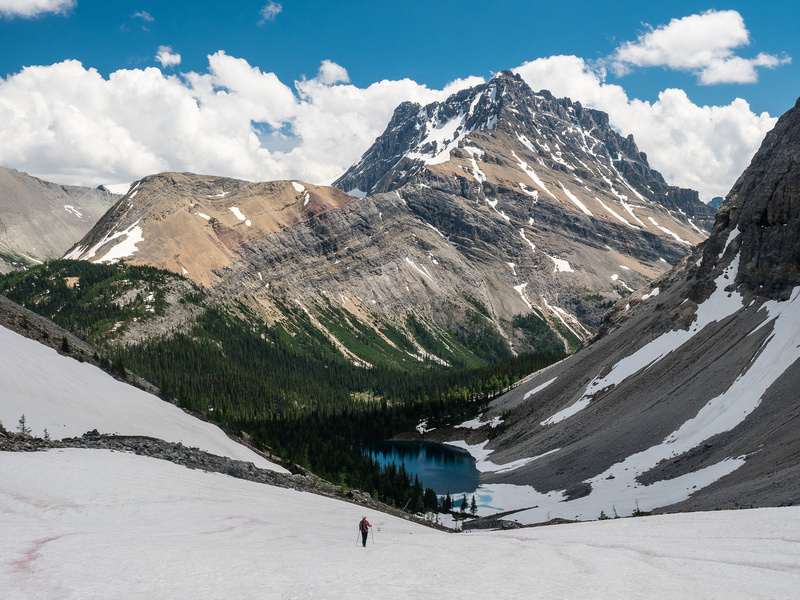 Secondly, unlike other historical areas of the Rockies such as Banff, some of the historical Rockies passes such as this one are largely untouched or at least unmodified by humans and still follow the original trails. Think about it. When’s the last time you found obviously ax hewn trees on the trail you were following like we did on the White Man Pass approach? Some brief history on the pass and Cross Lake follows (mostly gleaned from Wikipedia). 1841 – James Sinclair – 17 families are guided up the Spray River Valley from Banff towards British Columbia across the Great Divide at White Man Pass by a Cree chief named Maskepetoon. The pass likely took its name from the few Maritimers in the group (the others were all Metis). 1845 – Father Pierre-Jean De Smet – Comes east from Windermere Lake up to the pass where he erects his infamous wooden “Cross of Peace” near the pass which is where the river and its source lake get their names from. Rumors indicate that he met Vavasour and Warre here as well, remarkable considering how isolated this area is and how few other explorers were roaming it at the time. 1845 – Henry James Warre and Mervin Vavasour – Commissioned by the Hudson’s Bay Company to determine if British troops could realistically use the pass for passage to defend British interests in the Columbia District of the time (British Columbia). They reported back that essentially this idea was ludicrous thank to the remoteness and untamed nature of the terrain. 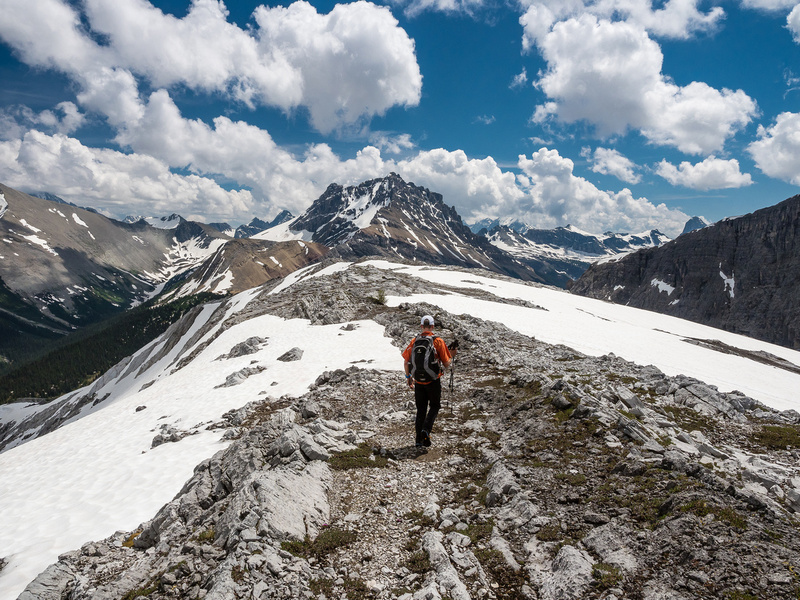 Descending the west face of Mount Currie proved quite easy – even easier than our ascent of the SE gully had been. Ascending this slope would be a bit tedious, thanks to the copious amount of scree on it, but would be pretty much only a steep hike. Down at the pass we crossed paths with a large Grizzly, thankfully all that remained were his tracks at this point or this could have been a more interesting tale. Phil kicked steps up several snow patches and within about 30-40 minutes we were on the summit of Cross Ridge with enticing views down to Cross and Pass Lakes with White Man Mountain stealing the majority of the views due to the cloud cover stubbornly clinging to the higher Assiniboine area summits. I think both Phil and I were a bit shocked when I pointed out how distant Mount Morrison looked from Cross Ridge – our return route went past it and much further and we were still walking away from the parking lot at this point! Descending the west face of Currie with Cross Ridge obvious in front of Red Man Mountain. Mount Byng at distant right. Looking back up the NW ridge of Currie to its summit and down the deep Currie Creek Valley at left to the distant Spray Lakes. At the bottom of the west face of Mount Currie, looking towards Cross Ridge at right. 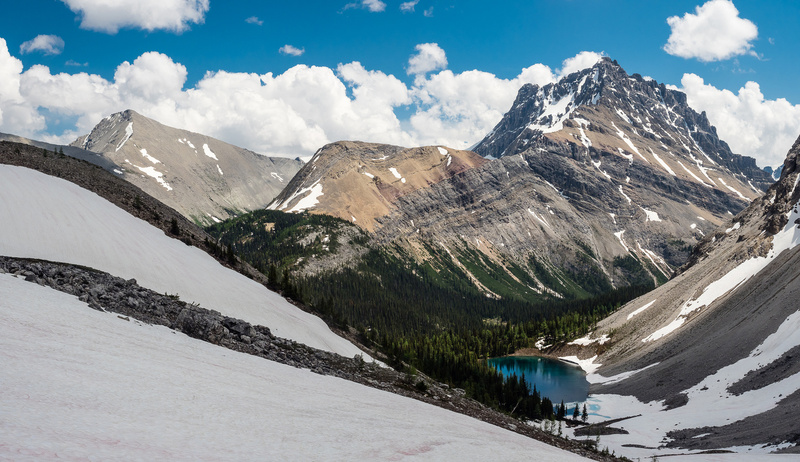 It was very tempting to simply follow Cross Ridge off it’s south end to the trail, but this would mean missing out on exploring Cross Lake – something I really didn’t want to miss out on. We backtracked a bit and glissaded and boot-skied snow slopes between Red Man Mountain and Cross Ridge until we had unobstructed views of Cross Lake with White Man Mountain looming impressively beyond. Pretty neat stuff. As we rounded the larch-ringed gem of deep blue/green mountain water, we felt privileged to be out here in this wilderness by ourselves with no signs of humans and no more mylar balloons either. 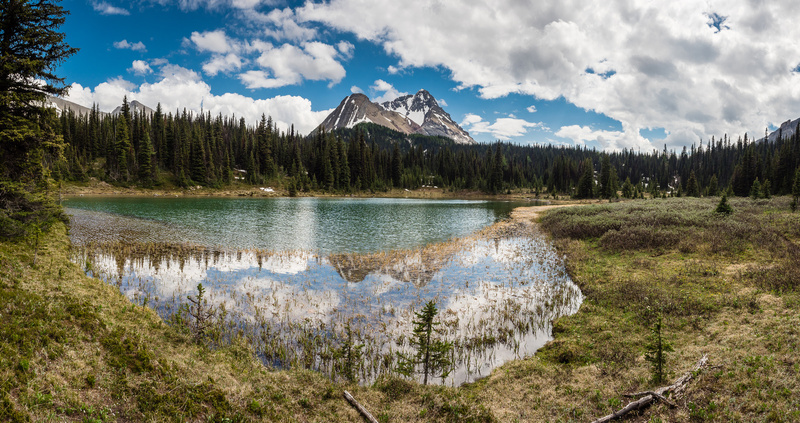 This little backcountry lake must be pure Heaven in the fall with the larches all lit up around it! 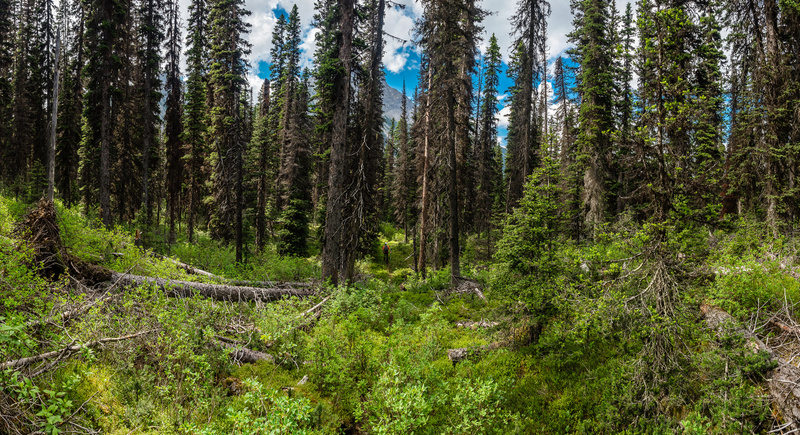 As difficult as it was for us to access it in a day from the Alberta side, it’s only about a 5km hike from the end of a logging road (Settler’s Road) on the BC side of the border – I have to admit that’s a wee bit depressing but c’est la vie. The Skyline Hikers have even run a large camps in the area such as the one they did in 2016 and when we got to the south end of the lake we discovered an old fire ring at a delightful random camp site situated on a carpet of yellow Glacier Lillies and surrounded by pine and larch trees. 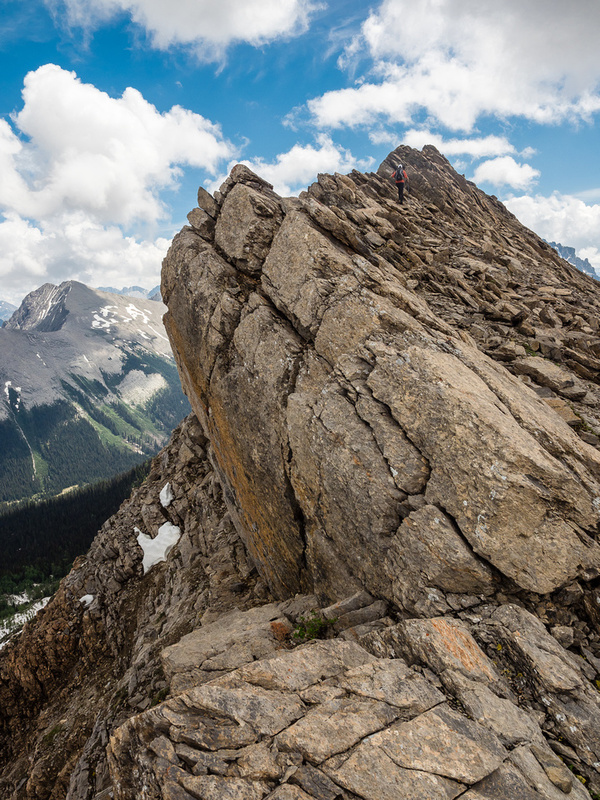 Phil scrambles along the summit ridge of Cross Ridge with Mount Currie rising to the left. Warre and Vavasour in between in the distance here. Phil at the giant summit cairn on Cross Ridge. I’m not sure who built them, or why (maybe the Boundary Commission?) but there’s huge cairns built on many of the high points in this area. Summit views looking east towards Mount Currie (L) with Warre, Vavasour and White Man Mountain to the right. Cross Lake with Vavasour (L) and White Man rising above. Lovely, deep little Cross Lake with Cross Ridge rising at left (summit not visible) and Warre and Vavasour at distant right. We drank deeply from the cold, refreshing Cross River (just a small stream at this point) gushing out of Cross Lake on its south end while listening to the chorus of birds and mediating on the fact that we were now on the lower BC side of White Man Pass and had a heckuva long hike back to our bikes at this point. It was strangely satisfying to sit there and wonder about the people who’d explored this area many years before. 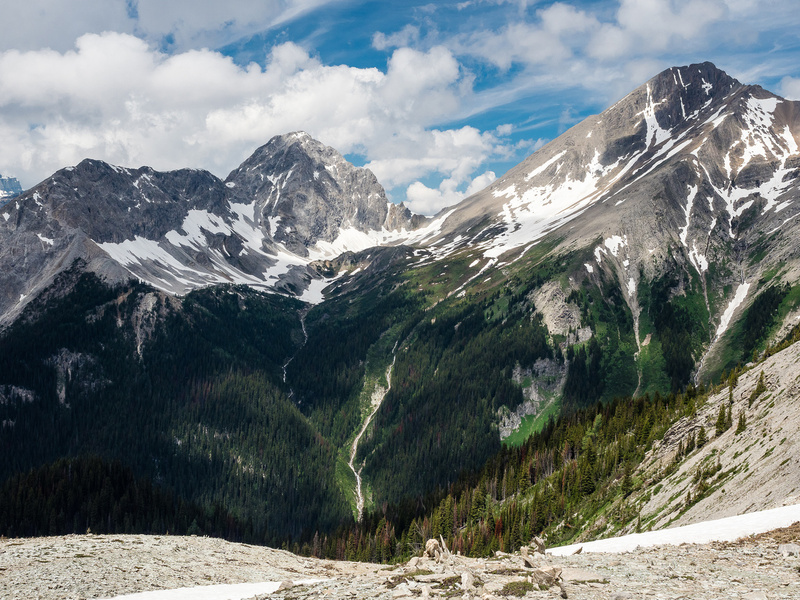 Considering the geological time scale that is always in our faces as we ramble throughout the Rockies, 177 years didn’t actually seem very long ago at all! It was also strange to meditate on the fact that for countless years before Europeans came along and named everything after WWI heroes and battleships, the Aboriginal people had walked past and camped at these passes and lakes as part of their regular lives. Reluctantly we decided that with 20+ km left to go and the afternoon starting to fade, we better get our butts away from Cross Lake. I only had a dotted line on my Gaia map to aim for as far as the White Man Pass trail was concerned, and it turned out rather faulty and inaccurate. We bushwhacked to where the trail should have been but didn’t find anything big enough. We followed faint animal trails up to the pass area instead, and even right at the pass, we couldn’t find anything nearly big enough to be the official trail! Hmmm. It was a bit annoying when we descended a steep drainage to Pass Lake only to pick up the trail on its west end and realize it goes much further south than indicated on my map. Oh well. I suspect that the Gaia map is using the outdated, old topo government base map to indicate where White Man Pass is, rather than any of the newer maps. It’s pretty accurate right to Pass Lake where it varies from reality by a wide margin. 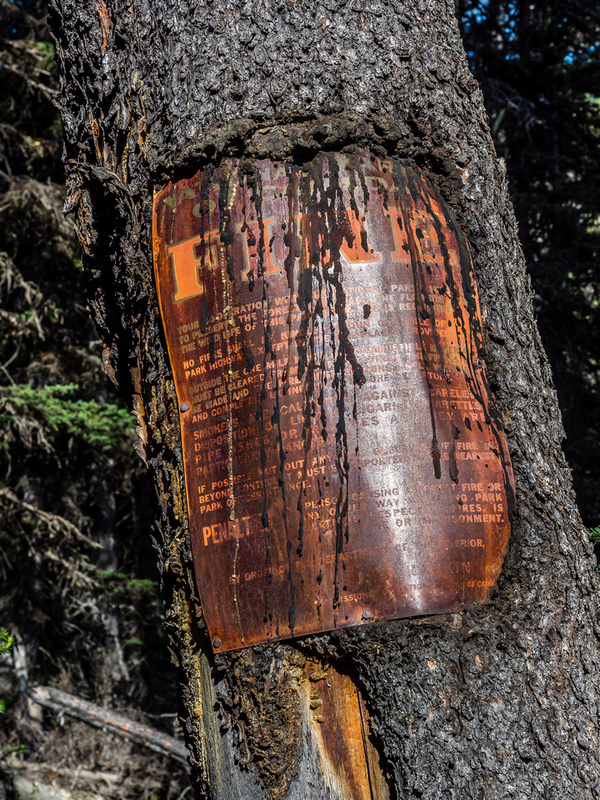 We certainly crossed the pass – just not on the currently maintained trail! 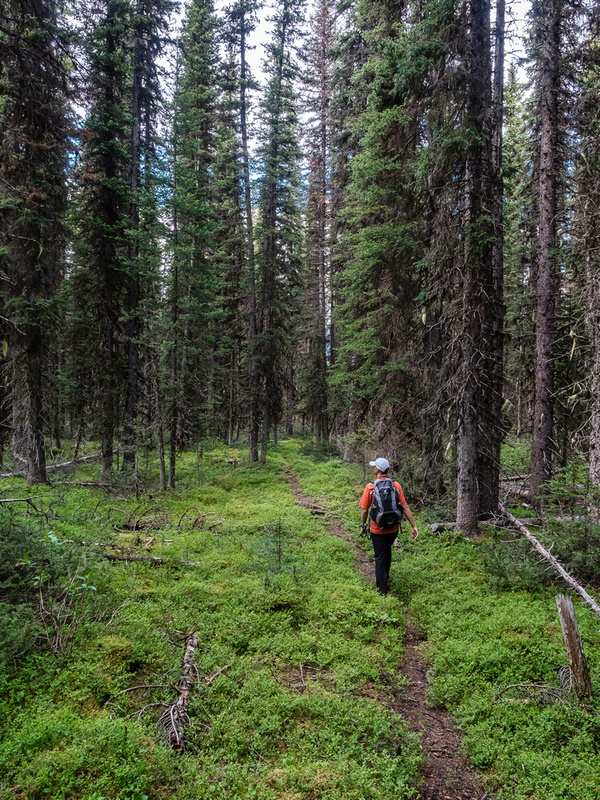 We went around a magical, sparkling green Pass Lake and continued to the avalanche flats between Currie and Warre that we’d left hours before. On the way we took a break beside a gurgling stream and I prostrated myself on my back, enjoying precious moments of inactivity while soaking up the sublimity of the natural world around us. Pass Lake with White Man Pass and Mountain in the background. The avalanches coming off the south face of Currie must be pretty darn big and impressive. Trees on the upslope of Mount Warre on the other side of the ~500m wide valley had been knocked down and sheared off!! We hiked through freshly cut trees stacked up and absolutely shredded by the forest as they were snapped off and swept through by walls of snow. This would not be a friendly place in high avy conditions. It was surprising, but very welcome, to see the fresh maintenance on the White Man Pass trail. It’s not a hugely popular one, as indicated by the wildflowers and grasses growing right on it, but it has been loved and cared for over the years. 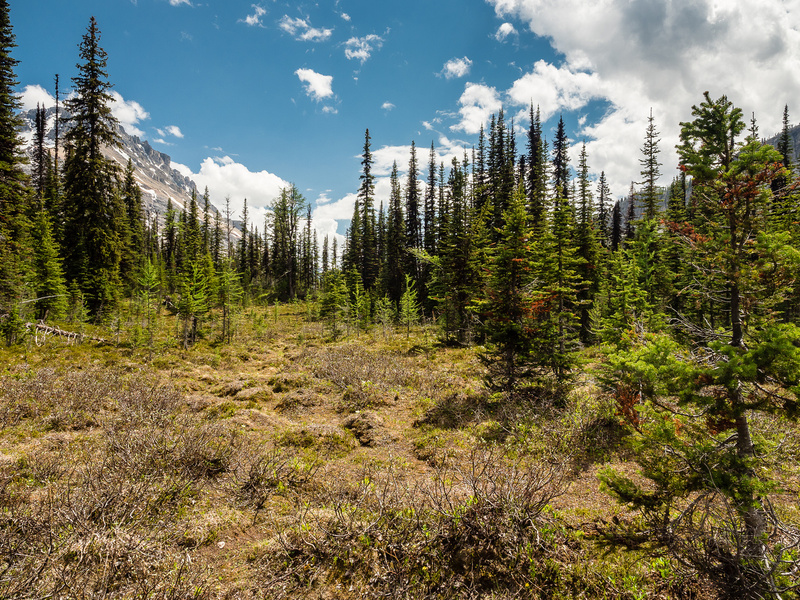 As we marched past Currie’s south slopes and started back down our approach, we marveled again at the large, ax-hewn trees that were evident beside portions of the trail – the markings in old trees and likely from long ago. Even the blazes along the trail are very old – most of them have almost disappeared and are simply strange round “growths” on the trees now. Re-crossing the swollen Currie Creek had been on my mind most of the day. I didn’t like where we’d originally crossed as it necessitated a slick log and deep water. 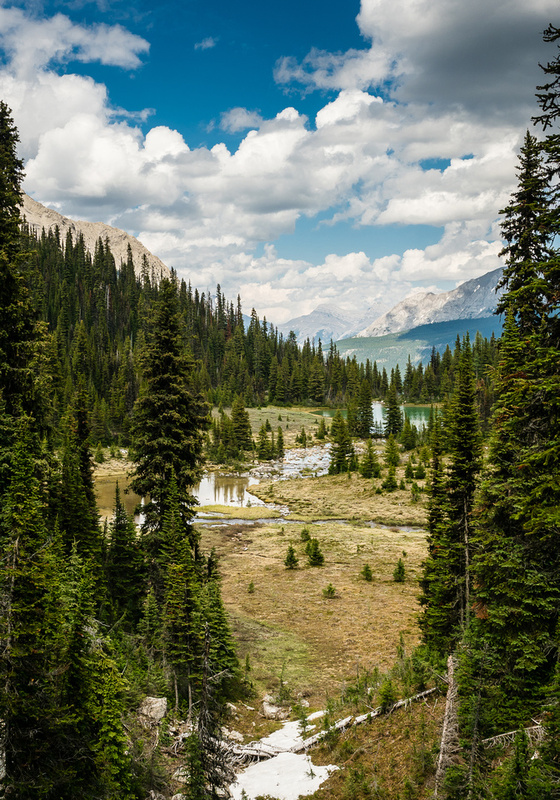 Falling off the log would result in possible tangling in a downstream tree – a definite drowning hazard. Looking at the base map on Gaia for the area, I noticed very flat contours and even a temporary split in the creek about 400m upstream of the official crossing. 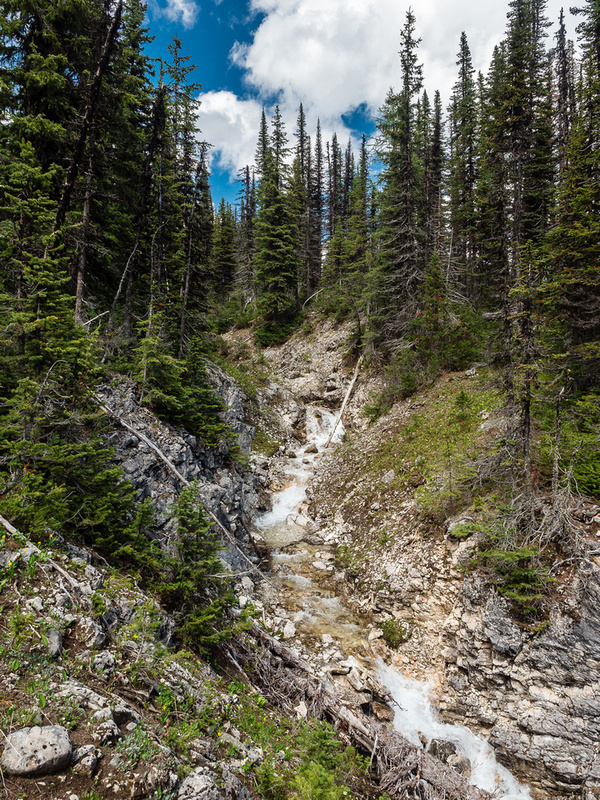 We cut off the trail and beelined through moderate forest towards this branch and found the crossing to be absolutely trivial compared to the morning – despite the creek being just as feisty. The trail should route here to be safer IMHO, but I’m sure Currie Creek is usually much lower and easier to cross. The best part about cross where we did, is that we had local knowledge of the decommissioned Currie Creek trail that we’d used to access Morrison 4 days previous. 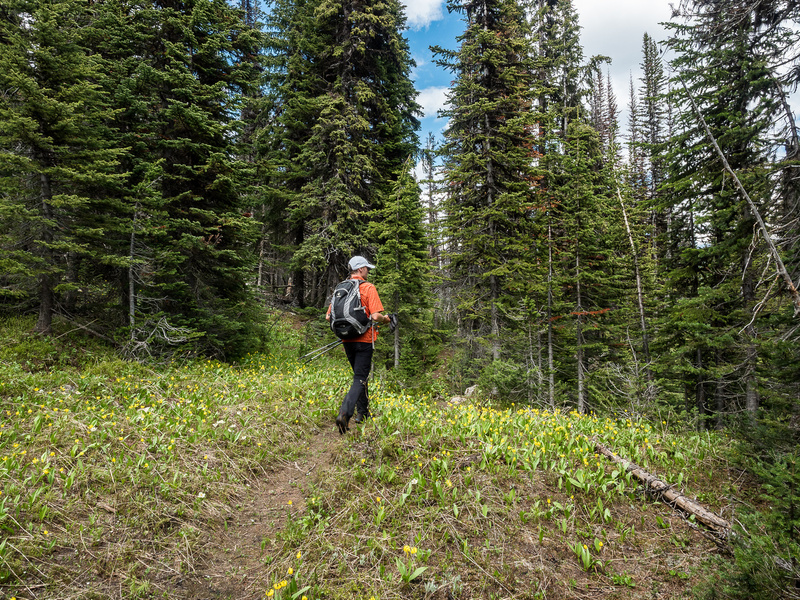 We simply kept bushwhacking towards it and were soon cruising down to rejoin the White Man Pass trail. A much easier crossing of Currie Creek. From the Currie Creek / White Man Pass trail junction we spent the next 1.5 hours of so, chatting and hiking back down the Spray River trail to our waiting bikes. For some reason the hike out from Cross Lake seemed much shorter than our exit from Owl Lake a few days previous – despite being quite a bit longer. Being engaged with the terrain keeps us entertained and somewhat distracted I guess. At the bikes we waited for a group of hikers to pass before mounting up and passing them on the long, annoying uphill out of Bryant Creek. As it was a few days previous, the bike ride out was quick and surprisingly refreshing even after ~32km and many hundreds of meters of height gain on foot. 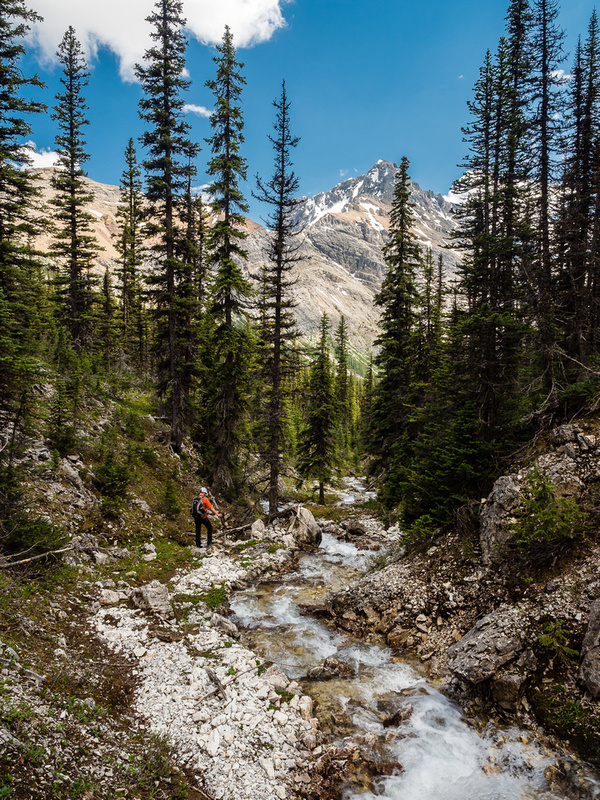 With 25 minutes of exiting the Spray River trail we were back at the parking lot, enjoying the buzz of a very remote and successful day in our beloved Rockies. Considering the White Man Pass area is pretty accessible via road (assuming all bridges along the Cross River / Settler’s Road are all open and maintained), I’m not sure how many folks would bother following our steps for a one day trip. 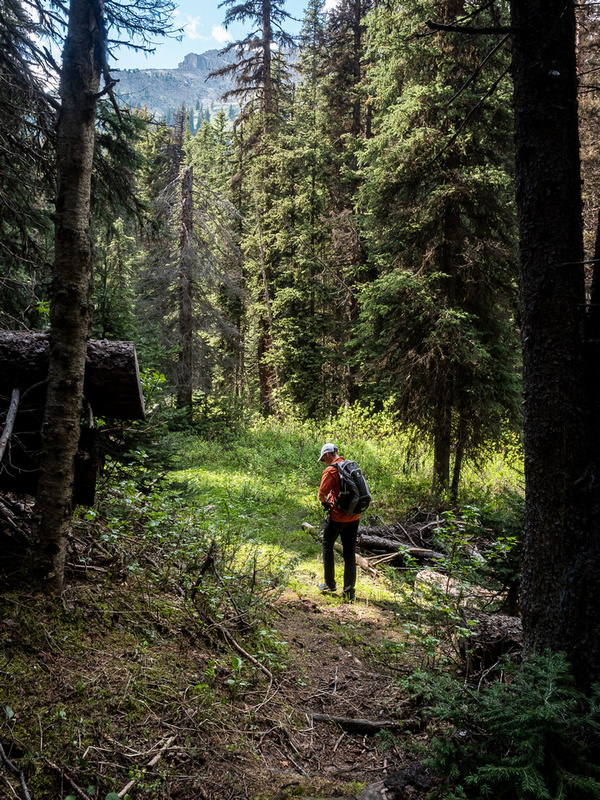 If you do follow, know that you will find yourself immersed in a world of both ancient and recent history and surrounded for hours and hours on end navigating your way through deep forests, wild streams and ridges in the sky. This is not the stuff that short, easy days are made of. 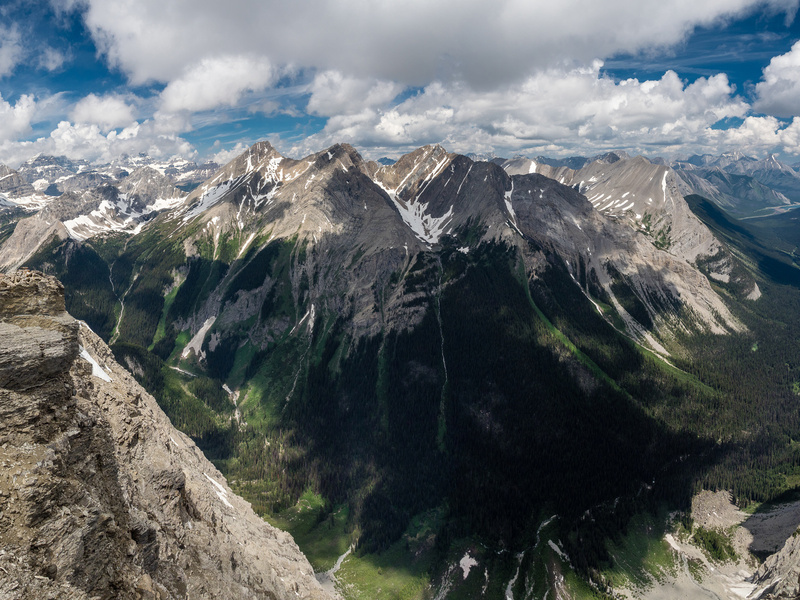 Looking down into the Currie Creek Valley and across to Aurora, Byng and Morrison (L to R). 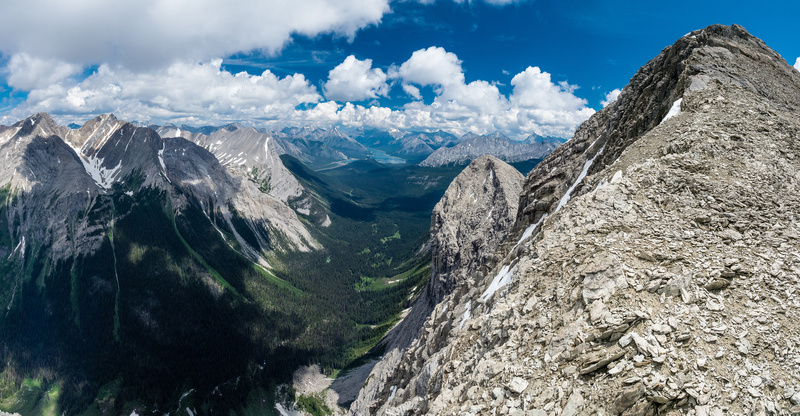 Wonderful Rockies scenery as we descend the west face, looking towards White Man Mountain and Talon Peak / Soderholm. 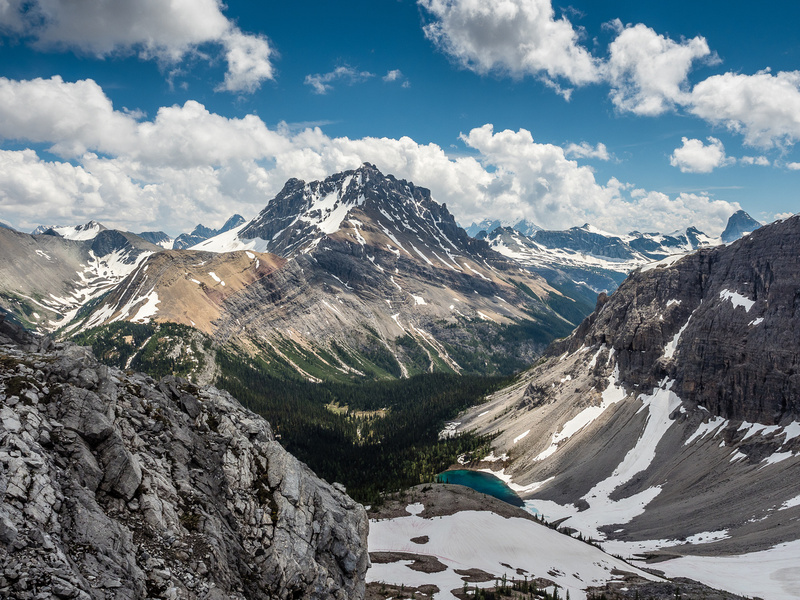 Looking north off the pass over Currie Creek towards Aurora (L) and Mount Byng (R). 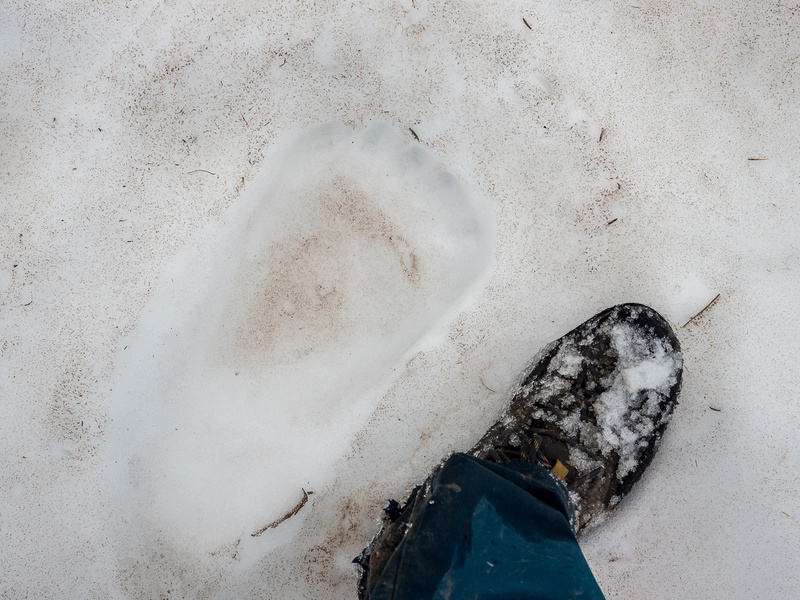 A size "10" grizzly track in the snow. Looking back at Mount Currie. For the most part, Cross Ridge is fairly easy. 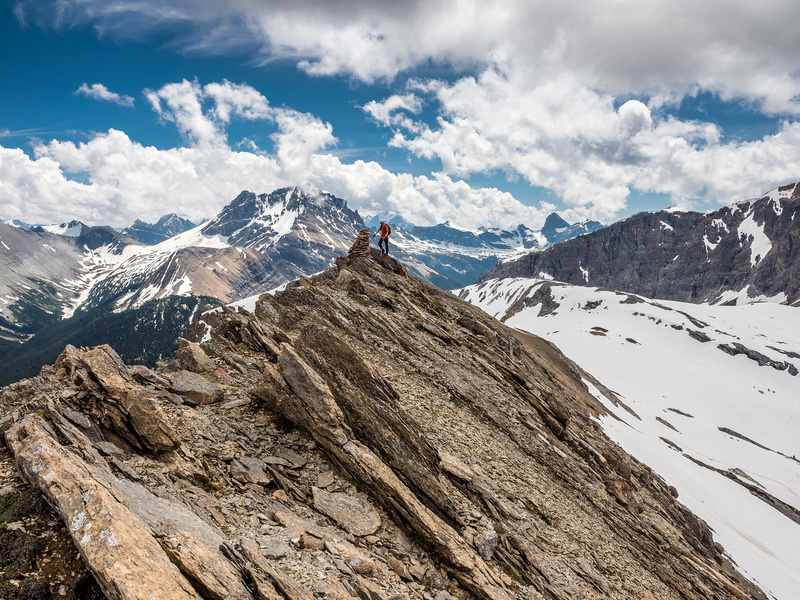 Phil scrambles along the summit ridge of Cross Ridge with Mount Currie rising to the left. There were some nice positions on the upper ridge. Phil at the giant summit cairn on Cross Ridge. Looking west (L) to Red Man Mountain with Aurora and the twin summits of Byng to the right. 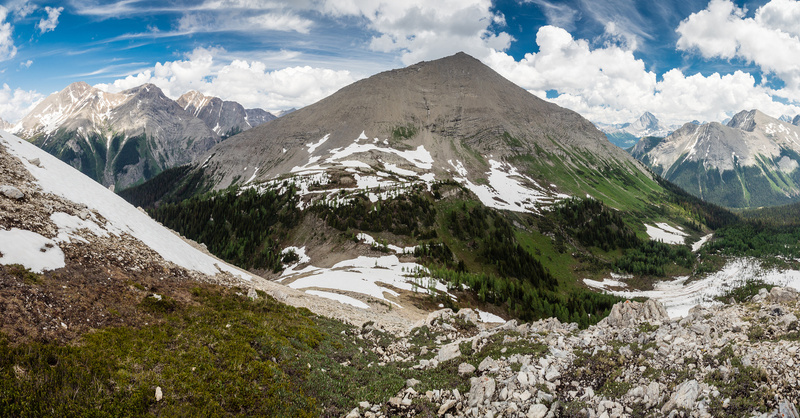 Looking back at the summits of Cross Ridge (C) and Mount Currie (R) as we descend to Cross Lake. Our first good glimpses of Cross Lake with White Man Mountain rising beyond. 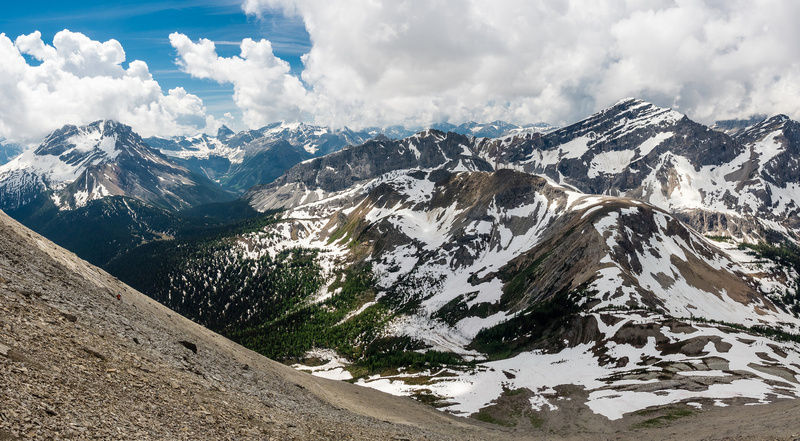 The entire White Man Pass area from the base of Mount Currie at left to the Cross River Valley into BC at right. Glissading into the valley leading to Cross Lake. It doesn't get much better than this! Descending to Cross Lake. [I can think of worse places to spend a few nights! Hard to believe how big this river gets a few kilometers downstream. 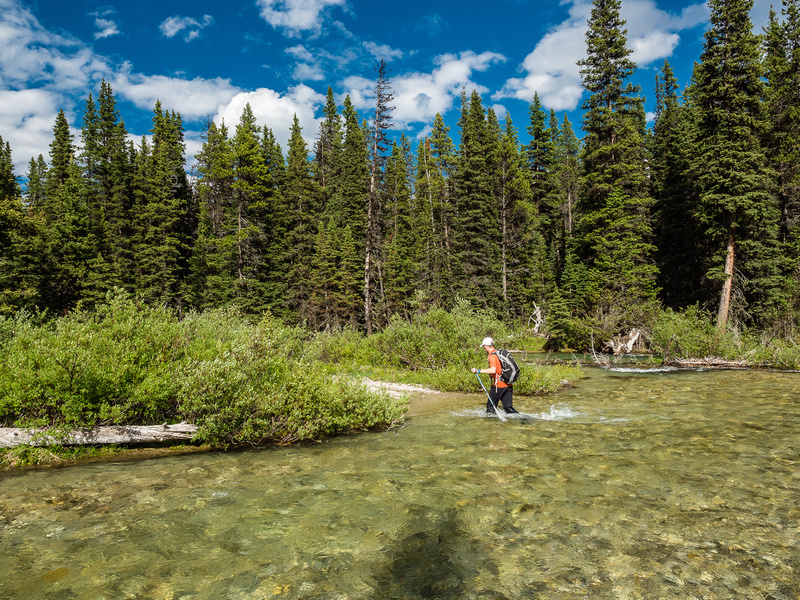 The Cross River eventually joins with the Mitchell River and then flows into the Kootenay. Phil hikes out along the stream that eventually becomes the Cross River. 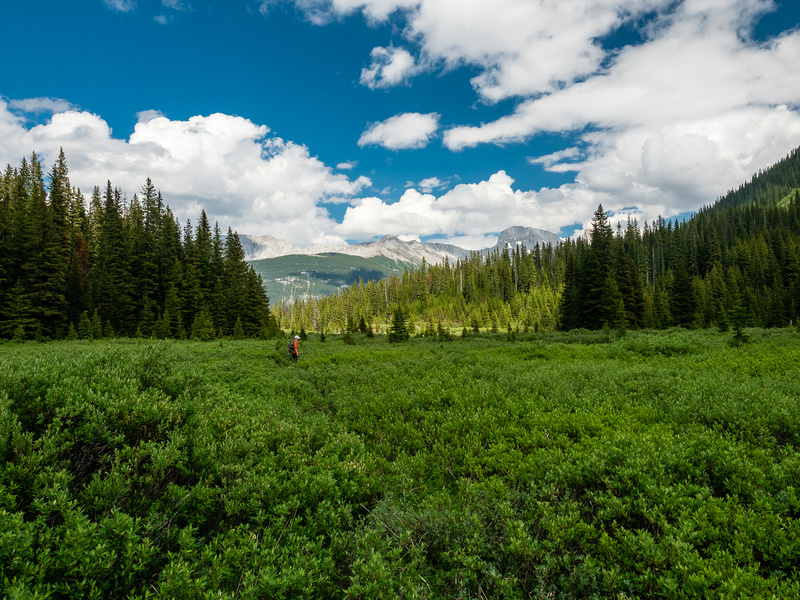 Like many Rockies passes, White Man Pass is more of a boggy meadow than a "pass". But this is a lovely wild place nonetheless. Descending (off trail at this point) to the proper trail and Pass Lake from White Man Pass. We managed to lose the main trail a few times from White Man Pass to the south slopes of Mount Currie, especially where it passed through boggy areas. There's a lot of maintenance on the White Man Pass trail. Back in the low scrub exiting towards the Spray River. At least it's all dried out now. Apparently there's a trail going directly down to the Spray River from here (R). It doesn't look very well used though. White Man Creek at right here. 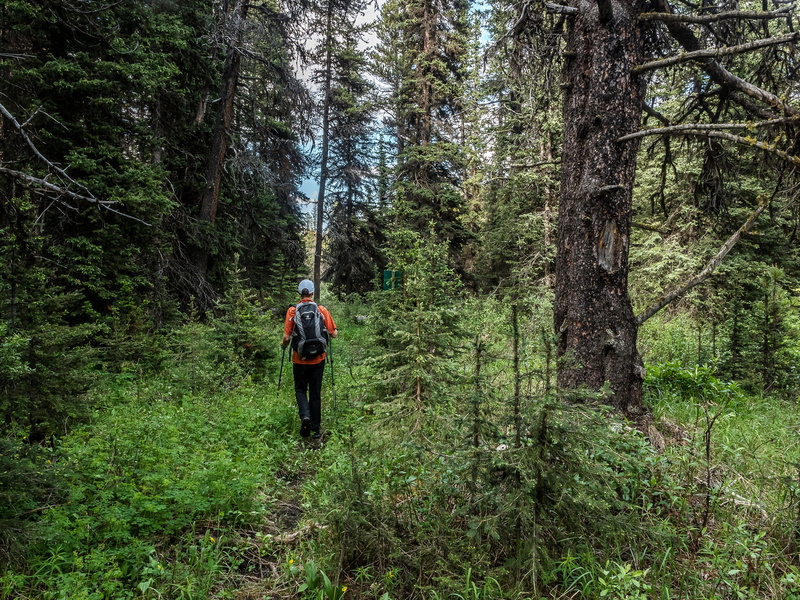 Hours and hours of forest hiking is good for the soul. More evidence of the history of this area is found at an old horse camp along the trail.